Early in one systematic theology PhD course at Fordham, the text assigned as theology opened by saying, “Theologians are scientists, and they are every bit as much scientists as people in the so-called ‘hard sciences’ like physics.” Not content with this striking claim, the author announced that she was going to use “a term from science,” thought experiment, which was never used to mean a Gedanken experiment as in physics, but instead meant: if we have an idea for how a society should run, we have to experimentally try out this thought and live with it for a while, because if we don’t, we will never know what would have happened. (“Stick your neck out! What have you got to lose?“—”Your head?”) The clumsiness in this use of “a term from science” was on par with saying that you are going to use “an expression from American English”, namely rabbit food, and subsequently use “rabbit food” as obviously a term meaning food made with rabbit meat. Rarely if ever used in any correct fashion.The one exception I can remember being Wolfhart Pannenberg’s illustration of a point by talking about fields such as one finds in the study of electricity and magnetism: the non-scientist theologians in the room said they were having real trouble understanding the illustration conceptually, which would make it seem somewhat dubious as an illustration to help get a point across. Always reflect an effort to claim some of science’s prestige.I remember the “you’re being quaint” smiles I got when I suggested that a point that Pannenberg was trying to make by comparing something to a field as defined in physics, seemed in fact to be a point that could have been much better made by a comparison to the Force from Star Wars.Why the patronizing smiles? The job of the example from physics was to mediate prestige as well as to illustrate a concept that could have been better explained without involving a particularly slippery concept from physics. I really wish the theology students I knew would either know a lot more about science, or a lot less, and I really wouldn’t consider “a lot less” to be disappointing. Let me explain why. When I was working on my master’s in math, there was one passage in particular that struck me from Ann Wilson Schaef’s Women’s Reality: An Emerging Female System. Perhaps predictably given my being a mathematician in training, it was a remark about numbers, or rather about how people interact with numbers. The author broke people down into more or less three groups of people. The first—she mentioned artists—was people that can’t count to twenty without taking off their shoes. She didn’t quite say that, but she emphasized artists and other people where math and numbers simply aren’t part of their consciousness. They don’t buy into the mystique. And they can say, and sincerely mean, that numbers don’t measure everything. They aren’t seriously tempted to believe otherwise. The second group—she mentioned business people—consists of people for whom math works. Even if they’re not mathematicians, math works for them and does useful things, and they may say that numbers don’t measure anything, but it is well nigh impossible to believe—saying and meaning that numbers don’t measure everything is like saying that cars are nice but they can’t get you places. And the third group in the progression? She mentioned scientists, but what she said was that they know math in and out and know it so well that they know its limitations and therefore they can say and mean that numbers don’t measure everything. And in the end, even though the “scientist” and the “artist” represent opposite extremes of mathematical competence, they both know there are things numbers can’t measure while the second, middle group for mathematical competence are in a position where they expect numbers to do things that numbers can’t do. I’d like to start by talking about Gödel’s Incompleteness Theorem. Now a lot of people have heard about Gödel’s Incompleteness Theorem. Not many major mathematical theorems have had a Pulitzer prize-winning book written around them (and by the way, Gödel, Escher, Bach has been one of my favorite books). Nor do many theorems get summarized in Newsweek as an important theorem which demonstrates that mathematical “proofs” are not certain, but mathematical knowledge is as relative as any other knowledge. Which is a crass error. The theological equivalent would be to say that Karl Barth’s unflattering remarks about “religion” are anti-Christian, or that liberation theology’s preferential option for the poor means that special concern for the poor is optional and to be dealt with according to personal preference. And saying that about liberation theology is a theological “squash like a grape,” because it is better to not know liberation theology and know you don’t know than believe that you understand liberation theology and “know” that the word “option” implies “optional.” It’s not what you don’t know that hurts you, but what you know that ain’t so. For the record, what Gödel’s Incompleteness Theorem means is that for a certain branch of mathematics, there are things that can be neither proven nor disproven—which made his theorem a shocker when there was a Tower of Babel effort to prove or disprove pretty much anything. It proves that some things can never be proven within certain systems. And it has other implications. But it does not mean that things that are proven in mathematics are uncertain, or that mathematical knowledge is relative. It says you can’t prove everything a mathematician would want to prove. But there are still lots and lots and lots of interesting things that can be proven, and Gödel’s Incompleteness Theorem does not touch these proofs, nor does it mean that mathematical knowledge is merely relative in humanities fashion. The same great mathematical logician proved another theorem, which does not have a Pulitzer prize winning book, which says that in one other branch of mathematics, besides the branch that Gödel’s Incompleteness Theorem speaks to, you can have pretty much what Gödel’s Incompleteness Theorem says you can’t have in the other branch. In other words, you can—mechanically, for that matter, which is a big mathematical achievement—either prove or disprove every single statement. I’m not sure it’s as important as Gödel’s Incompleteness Theorem, but it’s a major theorem from the same mathematician and no one’s heard of it. There would seem to be obvious non-mathematical reasons for why people would want to be informed about the first theorem and not want to mention the second. I consider it telling (about non-mathematical culture). I know it may be considered a mark of sophistication to mention Gödel’s Incompleteness Theorem and share how it’s informed your epistemology. But it hasn’t informed my epistemology and I really can’t tell how my theology would be different if I hadn’t heard of it. And my understanding is that other mathematicians tend not to have the highest view of people who are trying to take account of scientific discoveries that an educated person “should” know. There are other reasons for this, including goofy apologetics that make the famous theorem a proof for God. But I at least would rather talk with someone who simply hadn’t heard of the theorem than a theologian who had tried to make a “responsible” effort to learn from the discovery. Punctuated equilibrium, irreverently abbreviated ‘punk eek’, is a very interesting modification of Darwinian theory. Darwinian evolution in its early forms posits and implies a gradual process of very slow changes—almost constant over very long (“geological”) time frames. And that is a beautiful theory that flatly contracts almost all known data. That’s not the only problem; evolution appears to be, in Kuhnian terms (Structure of Scientific Revolutions), a theory “in crisis”, which is the Kuhnian term for when a scientific theory is having serious difficulties accounting for currently given data and may well be on its way out the door. There are several ways people are trying to cope with this—preserving some semblance of a materialist explanation; there was the same kind of resistance going on before science acknowledged the Big Bang, because scientists who want a universe without cause and without beginning or creator heard something that sounded too much like “Let there be light!” They’re very interesting, and intellectually dishonest. I wince when I see theologians trying their dutiful best to work out an obligation to take evolution into account as a proven fact: squash, like a grape. It’s not just that science doesn’t trade in proof and evolution is being treated like a revelation, as if a Pope had consulted the Pontifical Academy of the Sciences and canonized The Origin of the Species as a book of the Bible. Or maybe that’s putting it too strongly. It would also be strong language to say that many theologians are adopting a carefully critical attitude to classic Church claims and part of their being critical means placing an embarrassingly blind faith in evolution. But that’s truer than I’d want to admit. What about the second law of thermodynamics? I don’t know what the first and third laws of thermodynamics say, and I can’t say that I’m missing anything. I don’t feel obligated to make the second law, which I am familiar with, a feature of my theology, but if I did, I would try to understand the first and third laws of thermodynamics, and treat it as physics in which those three laws and presumably other things fit into a system that needs to be treated as a whole. I don’t know how I would incorporate that in my theology, but I’m supposing for the sake of argument that I would. I would rather avoid treating it the way people usually seem to treat it when they treat that as one of the things that educated people “should” know. I guess that my point in all of this is that some people think there’s a duty to know science and be scientific in theology, but this is a duty better shirked. My theology is—or I would like it to be—closer to that of someone who doesn’t understand science, period, than that of people who try to improve their theology by incorporating what they can grasp of difficult scientific concepts that the scientists themselves learned with difficulty. Rumor science is worse than no science, and an ascientific theology is not a handicap. When I say that I would rather see theologians know either much more or much less science, I’m not hoping that theologians will therefore get scientific degrees. The chief merit for a theologian to know science is that it can be a source of liberation that frees people from thinking “We live in a scientific age so it would be better for theology to be scientific.” I’m not sure I would be able to question that assumption if I knew much less science. But what I believe that buys me is not a better theology than someone scientifically innocent but freedom from the perceived need to “take science into account” in my theology so I can do the same kind of theology as someone scientifically innocent. I’m not as sure what to say about ecological theology; I wrote Hymn to the Creator of Heaven and Earth at without scientific reference that I remember, and I believe there are other human ways of knowing Creation besides science. But an ecological theologian who draws on scientific studies is not trying to honor a duty to understand things an educated person should know, but pursuing something materially relevant. Science has some place; religion and science boundary issues are legitimate, and I don’t know I can dissuade people who think it’s progressive to try to make a scientific theology—although I really wish people with that interest would get letters after their name from a science discipline, or some other form of genuinely proper scientific credentials appropriate to a genuinely scientific theology. There are probably other exceptions, and science is interesting. But there is no obligation to go from safely on one side of the road to a position in the middle because it is “closer” to a proper understanding of science. Perhaps liberation theologians want people to understand their cause, but it is better not to pretend to know liberation theology than to approach it in a way that leaves you “knowing” that the preferential option is optional. It isn’t what you know that hurts you, but what you know that ain’t so—and rumor science, with its accepted list of important scientific knowledge that scholars need to take into account, is one way to learn from what ain’t so. Science is the prestige discipline(s) today; you see psychology wishing for its Newton to lead it into the promised land of being a science in the fullest sense of the term. You don’t see psychology pining for a Shakespeare to lead it into the promised land of being a humanity in the fullest sense of the term. And the social disciplines—I intentionally do not say social sciences because they are legitimate academic disciplines but not sciences—are constantly insisting that their members are scientists, but the claim that theologians are scientists annoys me as a scientist and almost offends me as a theologian. It should be offensive for much the same reason that it should be offensive to insist on female dignity by claiming that women are really male, and that they are just as much male as people who can sire a child. It would be an interesting theological work to analyze today’s cultural assumptions surrounding science, which are quite important and not dictated by scientific knowledge itself, and then come to almost the same freedom as someone innocent of science. “My theology,” ewwww. (While I was at it, why didn’t I discuss plans for my own private sun and moon? I’m not proud of proudly discussing “my theology”.) I know the text has a wart or two. But the piece contains a suggestion: “rumor science” may be a red flag to a real problem in the place we give science. Art hesitated, and began to sit up. Art shrunk slightly towards his chair. “On a poetic level, I think it is an interesting development in your world’s history for a breakthrough in science, Einstein’s theory of relativity, to say that what is absolute is not time, but light. Space and time bend before light. There is a poetic beauty to Einstein making an unprecedented absolute out of light. But let us leave poetic appreciation of Einstein’s theory aside. “Rumor science”: The tip of an iceberg? But I would like to get on to something that is of far greater concern than “rumor science” as it treats Gödel’s Incompleteness Theorem, the second law of thermodynamics, relativity, evolution, and so on. If the only problem was making a bit of a hash of some scientific theories, that would be one thing. But “rumor science” may be the tip of an iceberg, a telling clue that something may be seriously amiss in how theology has been relating to science. There is another, far more serious boundary issue. What is knowledge like? “Adam knew Eve…” The primary word in the Old and New Testaments for sexual union is in fact ‘know’, and this is a significant clue about the intimate nature of knowledge. Knowledge is, at its core, the knowledge that drinks. It connects at a deepest level, and is cognate to how Orthodox say of the Holy Mysteries, “We have seen the true Light!”: to receive the Eucharist is to know. Knowledge is critical, meaning detached: the privileged position is of the outsider who stands clear of a situation and looks into a window. The devout believer enjoys no real advantage in grasping his religion compared to the methodical observer who remains detached—and the ordinary believer may be at a marked disadvantage. You can’t know how stars age or the limitations of the ideal gas law from direct personal experience. Science stems from a rationalism cognate to the Enlightenment, and even if one rebels against the Enlightenment, it’s awfully hard to know quarks and leptons solely by the intimacy of personal experience. What aspect of yourself do you know with? This may not be part of the standard Western picture, but the Orthodox, non-materialist understanding of mind holds that there is a sort of “spiritual eye” which knows and which grasps spiritual realities as overflow to its central purpose of worshiping God. The center of gravity for knowing is this spiritual eye, and it is the center of a whole and integrated person. Logical and other “discursive” reasoning may have a place, but the seat of this kind of reasoning is a moon next to the light of the sun which is the spiritual eye, the nous. Good scholarship comes from putting all other aspects of the person in their place and enthroning the part of us that reasons logically and almost putting the logic bit on steroids. Continental philosophy may rebel against this, but it rebels after starting from this point. We have a slightly more rigorous use of primarily logical reasoning and a subject domain that allows this reasoning to shine. What should teachers cultivate in their students? Teachers should induce students into discipleship and should be exemplary disciples themselves. They should train students who will not be content with their teachers’ interpretations but push past to their own takes on the matter. They should train students to develop experiments and theories to carefully challenge the “present working picture” in their field. How much emphasis do you place on creativity? It reflects some degree of fundamental confusion to measure the value of what someone says by how original it is. That which is true is not original, and that which is original is not true. Perhaps people may uncover new layers of meaning, but to measure someone by how many ideas he can claim as “mine” is a strange measure. Publish something original, or perish. Better to say something original but not true than not have any ideas to claim as “mine.” If need be, rehabilitate Arius or Nestorius. (Or, if you are Orthodox, meet current fashions halfway and show that St. Augustine need not be a whipping boy.) Continue to push the envelope. Are you an experimental physicist? If you cannot observe anything new by the layman’s means of observation, pioneer new equipment or a clever experiment to push the envelope of what can be observed. Publish something original or perish. Where does your discipline place its empiricism? There is a very real sense of empiricism, albeit a sense that has very little directly to do with empirical science. Knowledge is what you know through the “spiritual eye” and it is a knowledge that can only be realized through direct participation. An “idle word” may be a word of that which you do not have this knowledge of, and this sin would appear to be foundational to the empiricism of science. We really do have an empiricism, but it might be better not to engender pointless confusion by claiming to be empirical when the empiricism known to the academy is pre-eminently that of empirical science, whether it is either actual or aspiring science. Theologians are just as empirical as physicists, whether or not they know basic statistics. We have such quasi-scientific empiricism as can be had for the human and divine domain we cover; there is a great deal of diversity, and some of us do not place much emphasis on the empiricism of science, but some of us have enough of scientific empiricism to do history work that stands its ground when judged by secular history’s standards. As much as theology’s empiricism is the empiricism of a knowledge of the “spiritual eye” and the whole person, our empiricism is an empiricism of detached, careful, methodical, reasoned investigation—the investigation of the reasoning faculty on steroids. Our science exhibits professionalism and a particular vision of intellectual virtue. Our empiricism corresponds to this vision, and no one has pushed this empiricism of the reasoning faculty further, and the unique technology founded on science is a testament to how far we have pushed this kind of empiricism. When they are lined up, academic theology appears to have a great many continuities with science and a real disconnect with Orthodox Christianity. Could academic theologians feel an inferiority complex about Not Being Scientific Enough? Absolutely. But the actual problem may be that they are entirely too scientific. I am less concerned that their theology is not sufficiently scientific than that it is not sufficiently theological. Origins questions: can we dig deeper? It is along those lines that I have taken something of the track of “join the enemy’s camp to show its weaknesses from within” in exposing the blind spots of Darwinism, for instance. In the theologically driven short story The Commentary, the issue is not really whether Darwinism is correct at all. The question is not whether we should be content with Darwinian answers, but whether we should be content with Darwinian questions. 1:1 In the beginning God created the heavens and the earth. 1:2 The earth was without form and void, and darkness was upon the face of the deep; and the Spirit of God was moving over the face of the waters. 1:3 And God said, “Let there be light”; and there was light. The reader is now thinking about evolution. He is wondering whether Genesis 1 is right, and evolution is simply wrong, or whether evolution is right, and Genesis 1 is a myth that may be inspiring enough but does not actually tell how the world was created. All of this is because of a culture phenomenally influenced by scientism and science. The theory of evolution is an attempt to map out, in terms appropriate to scientific dialogue, just what organisms occurred, when, and what mechanism led there to be new kinds of organisms that did not exist before. Therefore, nearly all Evangelicals assumed, Genesis 1 must be the Christian substitute for evolution. Its purpose must also be to map out what occurred when, to provide the same sort of mechanism. In short, if Genesis 1 is true, then it must be trying to answer the same question as evolution, only answering it differently. Where the reader only sees one question, an ancient reader saw at least two other questions that are invisible to the present reader. As well as the question of “How?” that evolution addresses, there is the question of “Why?” and “What function does it serve?” These two questions are very important, and are not even considered when people are only trying to work out the antagonism between creationism and evolutionism. Martin took a deep breath. Was the text advocating a six-day creationism? That was hard to tell. He felt uncomfortable, in a much deeper way than if Bible-thumpers were preaching to him that evolutionists would burn in Hell. There is a hint here of why some people who do not believe in a young earth are no less concerned about young earth creationism: the concern is not exactly that it is junk science, but precisely that it is too scientific, assuming many of evolutionary theory’s blindnesses even as it asserts the full literal truth of the Bible in answering questions on the terms of what science asks of an origins theory. Pointy-haired boss: I’m sending you to Elbonia to teach a class on Cobol on Thursday. Dilbert: But I don’t know Cobol. Can’t you ask Wally? He knows Cobol! Pointy-haired boss: I already checked, and he’s busy on Thursday. Pointy-haired boss: Ok, are you free on Tuesday? Dilbert: You’re answering the wrong question! I’d like to dig into another trick question: “When was the world created: 13.7 billion years ago, or about six thousand years ago?” The answer in fact is “Neither,” but it takes some explaining to get to the point of realizing that the world was created 3:00 PM, March 25, 28 AD. Adam fell and dragged down the whole realm of nature. God had and has every authority to repudiate Adam, to destroy him, but in fact God did something different. He called Noah, Abraham, Moses, and Elijah, and in the fullness of time he didn’t just call a prophet; he sent his Son to become a prophet and more. What does this mean? It means more than Pilate could have possibly dreamed of, and “Adam” means “man”: Behold the man! Behold Adam, but not the Adam who sinned against God and dragged down the Creation in his rebellion, but the second Adam, the new Adam, the last Adam, who obeyed God and exalted the whole Creation in his rising. Behold the man, Adam as he was meant to be. Behold the New Adam who is even now transforming the Old Adam’s failure into glory! Behold the man! Behold the first-born of the dead. 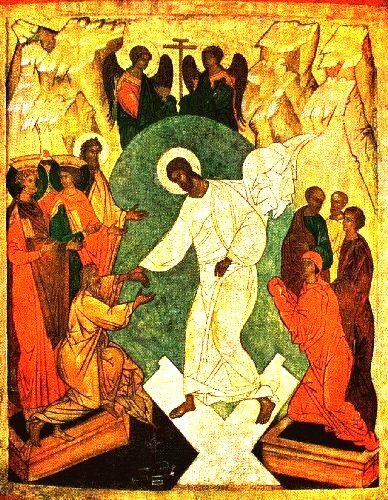 Behold, as in the icon of the Resurrection, the man who descends to reach Adam and Eve and raise them up in his ascent. Behold the man who will enter the realm of the dead and forever crush death’s power to keep people down. An icon of the Resurrection. Behold the man and behold the firstborn of many brothers! You may know the great chapter on faith, chapter 11 of the book of Hebrews, and it is with good reason one of the most-loved chapters in the Bible, but it is not the only thing in Hebrews. 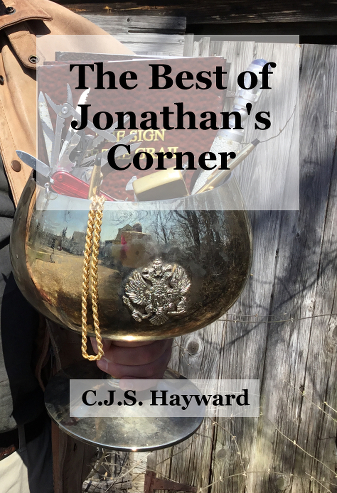 The book of Hebrews looks at things people were caught up in, from the glory of angels to sacrifices and the Mosaic Law, and underscores how much more the Son excels above them. A little before the passage we read above, we see, “To which of the angels did he ever say, ‘You are my son; today I have begotten you’?” (Hebrews 1:5) And yet in John’s prologue we read, “To those who received him and believed in his name, he gave the authority to become the children of God.” (John 1:9) We also read today, “To which of the angels did he ever say, ‘Sit at my right hand until I have made your enemies a footstool under your feet? '” (Hebrews 1:13) And yet Paul encourages us: “The God of peace will shortly crush Satan under your feet,” (Romans 16:20) and elsewhere asks bickering Christians, “Do you not know that we will judge angels?” (I Corinthians 6:3) Behold the man! Behold the firstborn of many brothers, the Son of God who became a man so that men might become the Sons of God. Behold the One who became what we are that we might by grace become what he is. Behold the supreme exemplar of what it means to be Christian. Behold the man and behold the first-born of all Creation, through whom and by whom all things were made! Behold the Uncreated Son of God who has entered the Creation and forever transformed what it means to be a creature! Behold the Saviour of the whole Creation, the Victor who will return to Heaven bearing as trophies not merely his transfigured saints but the whole Creation! Behold the One by whom and through whom all things were created! Behold the man! Then and there, the entire work of Creation, which we read about from Genesis onwards, was complete. There and no other place the world was created, at 3:00 PM, March 25, 28 AD. Then the world was created. I wince at the idea that for theologians “boundary issues” are mostly about demonstrating the compatibility of timeless revealed truths to the day’s state of flux in scientific speculation. I wince that theologians so often assume that the biggest contribution they can give to the dialogue between theology and science is the rubber stamp of perennially agreeing with science. I would decisively prefer that when theologians “approach religion and science boundary issues,” we do so as boundaries are understood in pop psychology—and more specifically bad pop psychology—which is all about you cannot meaningfully say “Yes” until it is your practice to say “No” when you should say “No”: what theology needs in its boundaries with science is not primarily a question of what else we should seek to embrace, but of where theology has ingested things toxic to its constitution. What gets lost when theology loses track (by which I do not mean primarily rumor science, but the three columns where theology seemed a colony of science that had lost touch with Orthodox faith) is that when theology assumes the character of science, it loses the character of theology. The research for my diploma thesis at Cambridge had me read a lot of historical-critical commentary on a relevant passage; I read everything I could find on the topic in Tyndale House’s specialized library, and something became painfully obvious. When a good Protestant sermon uses historical or cultural context to illuminate a passage from Scripture, the preacher has sifted through pearls amidst sand, and the impression that cultural context offers a motherlode of gold to enrich our understanding of the Bible is quite contrary to the historical-critical commentaries I read, which read almost like phone books in their records of details I’d have to stretch to use to illuminate the passage. The pastor’s discussion of context in a sermon is something like an archivist who goes into a scholar’s office, pulls an unexpected book, shows that it is surprisingly careworn and dog-eared, and discusses how the three longest underlined passage illuminate the scholar’s output. But the historical-critical commentary itself is like an archivist who describes in excruciating detail the furniture and ornaments in the author’s office and the statistics about the size and weight among books the scholar owned in reams of (largely uninterpreted) detail. How shall I praise thee, O Lord? Greater than can be thought. In thee is wisdom, and praise, and every good thing. God immeasurable, immortal, eternal, ever glorious, and humble. What mighteth compare to thee? The One who is greater than infinity art thou. What tongue mighteth sing of thee? Of divinised men joining rank on rank of angel. The divine became man that man mighteth become divine. God: Arthur! Arthur, King of the Britons! Oh, don’t grovel! If there’s one thing I can’t stand, it’s people groveling. God: And don’t apologize. Every time I try to talk to someone it’s ‘sorry this’ and ‘forgive me that’ and ‘I’m not worthy’. What are you doing now!? Arthur: I’m averting my eyes, O Lord. God: Well, don’t. It’s like those miserable Psalms—they’re so depressing. Now knock it off! This is blasphemous, and I tried to keep my mouth shut about what my host had presented to me, I thought, for my rollicking laughter. But subsequent conversation showed I had misjudged his intent: he had not intended it to be shockingly funny. He had, in fact, played the clip because it was something that he worried about: did God, in fact, want to give grumbling complaints about moments when my friend cried out to him in prayer? Does prayer annoy our Lord as an unwelcome intrusion from people who should have a little dignity and leave him alone or at least quit sniveling? This is much more disturbing than merely playing the clip because you find it funny to imagine God bitterly kvetching when King Arthur tries to show him some respect. If it is actually taken as theology, Monty Python is really sad. And it is not the best thing to be involved in Monty Python as theology. There are many more benign examples of academic theology; many of even the problems may be slightly less striking. But theology that gives the impression that it could be from Monty Python is a bit of a dead (coal miner’s) canary. Scientific theology does not appear to be blame for all of these, but it is not irrelevant. Problems that are not directly tied to (oxymoronic) scientific theology are usually a complication of (oxymoronic) secular theology, and scientific theology and secular theology are deeply enough intertwined. The question of evolution is important, and it is no error that a figure like Philip Johnson gives neo-Darwinian evolution pride of place in assessing materialist attacks on religion. But it is not an adequate remedy to merely study intelligent design. Not enough by half. If theology could, like bad pop psychology, conceive of its “boundary issues” not just in terms of saying “Yes” but of learning to stop saying “Yes” when it should say “No”, this would be a great gain. So far as I have seen, the questions about boundaries with science are primarily not scientific ideas theology needs to assimilate, but ways theology has assimilated some very deep characteristics of science that are not to its advantage. The question is less about what more could be added, than what more could be taken away. And the best way to do this is less the Western cottage industry of worldview construction than a journey of repentance such as one still finds preached in Eastern Christianity and a good deal of Christianity in the West. Repentance is Heaven’s best-kept secret. Repentance has been called unconditional surrender, and it has been called the ultimate experience to fear. But when you surrender what you thought was your ornament and joy, you realize, “I was holding on to a piece of Hell!” And with letting go comes hands that are free to grasp joy you never thought to ask. Forgiveness is letting go of the other person and finding it is yourself you have set free; repentance is being terrified of letting go and then finding you have let go of needless pain. Repentance is indeed Heaven’s best-kept secret; it opens doors. I have doubt whether academic theology will open the door of repentance; it is a beginner’s error to be the student who rushes in to single-handedly sort out what a number of devout Christian theologians see no way to fix. But as for theologians, the door of repentance is ever ready to open, and with it everything that the discipline of theology seeks in vain here using theories from the humanities, there trying to mediate prestige to itself science. Academic theologians who are, or who become, theologians in a more ancient sense find tremendous doors of beauty and joy open to them. The wondrous poetry of St. Ephrem the Syrian is ever open; the liturgy of the Church is open; the deifying rays of divine grace shine ever down upon those open to receiving tem and upon those not yet open. The Western understanding is that the door to the Middle Ages has long since been closed and the age of the Church Fathers was closed much earlier; but Orthodox will let you become a Church Father, here now. Faithful people today submit as best they are able to the Fathers before them, as St. Maximus Confessor did ages ago. There may be problems with academic theology today, but the door to theology in the classic sense is never closed, as in the maxim that has rumbled through the ages, “A theologian is one who prays, and one who prays is a theologian.” Perhaps academic theology is not the best place to be equipped to be a giant like the saintly theologians of ages past. But that does not mean that one cannot become a saintly theologian as in ages past. God can still work with us, here now. in the wisdom of Heaven! in the brilliant darkness of a hidden silence. on what is most manifest. with treasures beyond all beauty. Let us ever seek the theology of living faith!